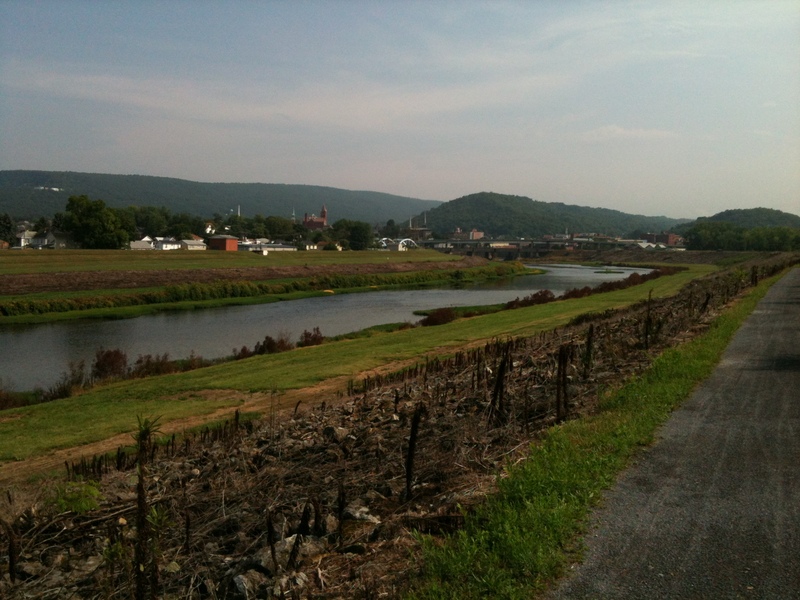 Cumberland Maryland is where we started. It is a very beautiful and easy trail to ride. 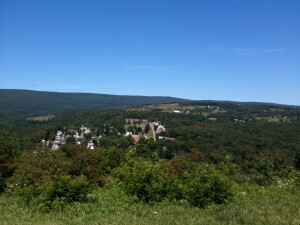 It has very breath taking views of the mountains. A trail that you will want to ride over and over. July 21st, 2012: We spent a large part of the evening before making our 6 hour drive from our homes in Victoria, VA to Cumberland, MD where we will begin our adventure. 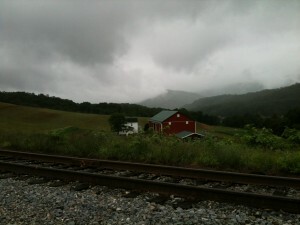 We had driven through storms and terrific rain over the mountains to arrive in Cumberland. Now it was Saturday morning and it is cool and misting rain. I headed down to begin unloading the bikes from the truck and do the maintenance checks and get the gear loaded. With the weather being cool and damp and the day promising 15 miles of trail and over 2,000 feet of elevation gain I fully expected to hear “we’ll meet you in Frostbutg” but much to my surprise a few minutes later all the gang as lined up by the truck in their cycling gear ready to embark on our first long and somewhat challenging adventure. We had spent the night at the Holiday Inn Express which is 3 to 4 blocks uphill from the Train Station. 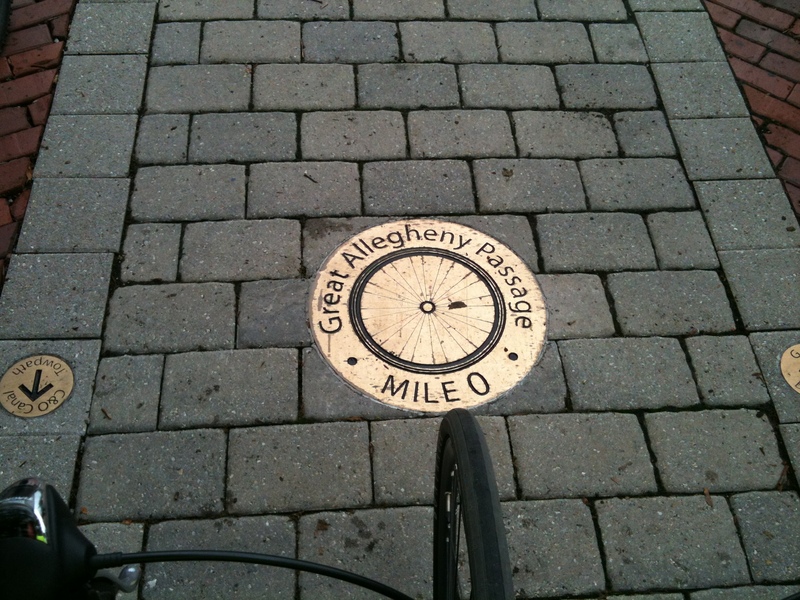 Mile “0” of the Great Allegheny Passage is located right out side the train station which serves as a visitor’s center. 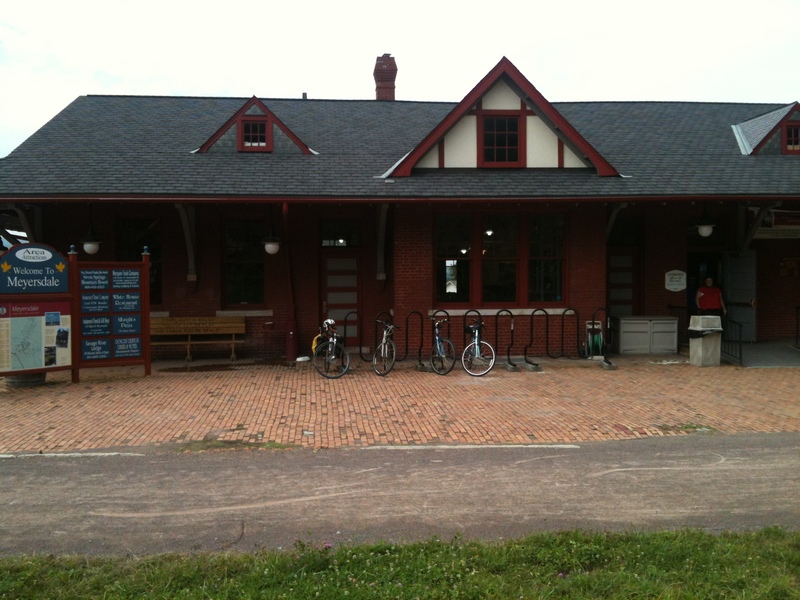 We rolled out of Cumberland after a brief visit to the Train Station. Pedaling up the brick paved walkway and ramp out onto the GAP. 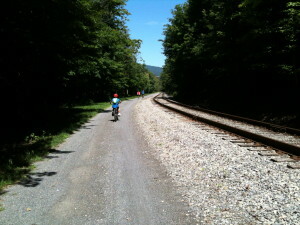 As we pedaled along we began to immediately rise out of town and out into the countryside or should I say Mountainside. The views were already beginning to get awesome with just over a mile behind us. With our group ranging in age from 8 to 56 the constant 2 to 3 percent grade posed a challenge over our 16 mile journey to frostbug. We were pleasantly provided with a well packed crushed stone trail and Very Awesome views! We also met the train on the way up the mountain. 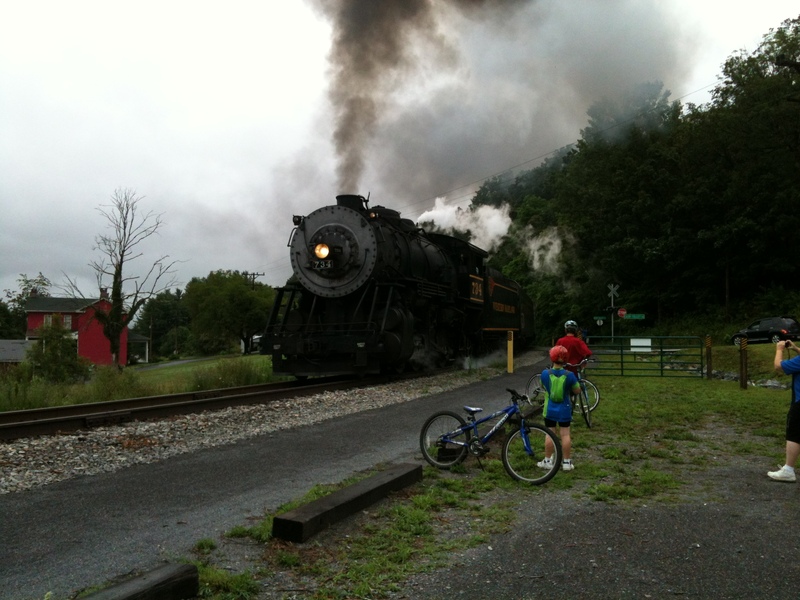 The old steam locomotive runs from Cumberland to Frostburg and back each day. It was really neat to watch it chugging up the grade and reminding us to just keep pouring the coal on and we would soon get there too. We arrived in Frostburg to find a nice welcome kiosk and the switchback walkway up to the Inn. 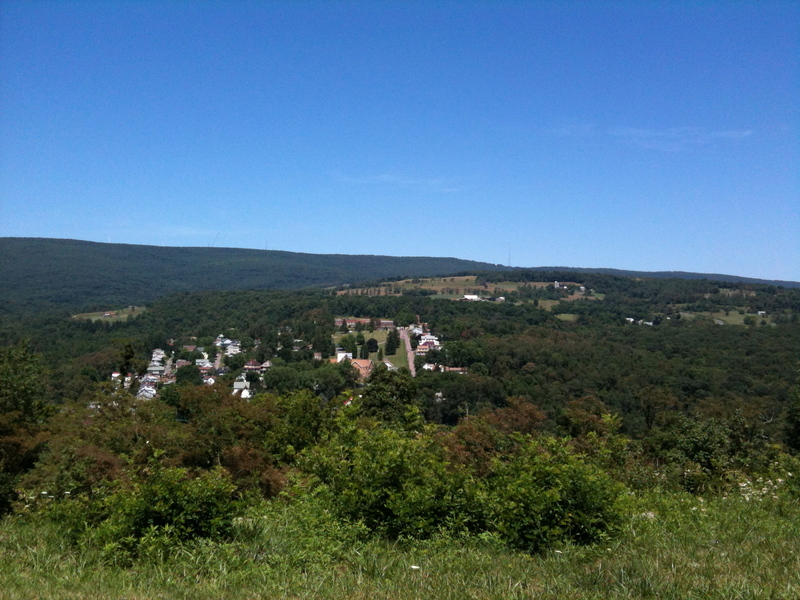 Our stay at Frostburg was very pleasant and the food was great and reminded me of home town diners we have in the south. July 22, 2012: After a good night’s rest and a good breakfast at the Inn we gathered our bikes and gear and were ready to leave Frostburg and head out for our next stop at Meyersdale, PA. Less than a mile from Frostburg we encountered a tree down across the trail most likely from the storms two nights earlier. Several cyclists were there and we all aided each other getting bikes and gear over the tree. Most cyclist especially touring cyclists you meet are friendly and will go out on a limb for you, literally. 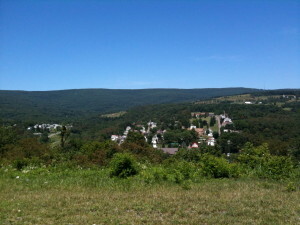 Leaving Frostburg we were still heading uphill. 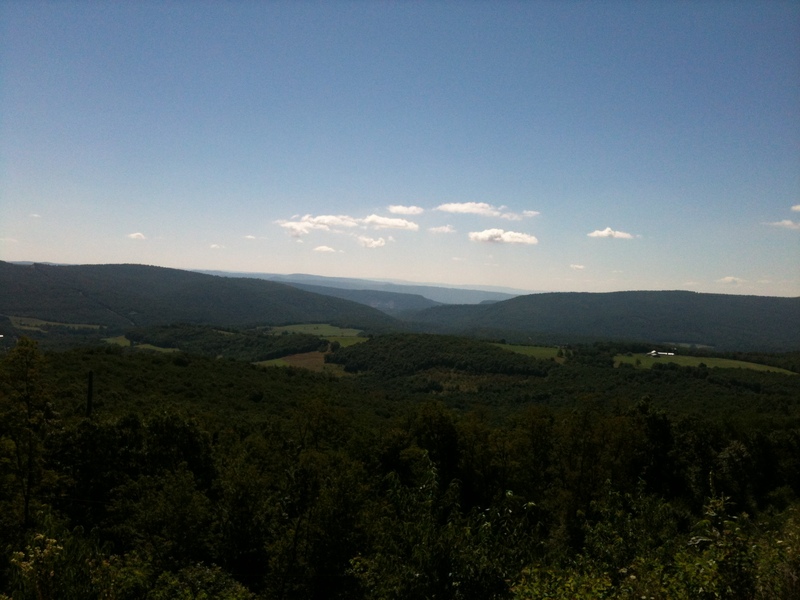 We would continue to climb until we reached the Eastern Continental Divide later in the day. 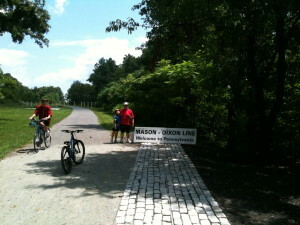 Meanwhile as we climbed along we reached the Mason Dixon line at about 12:45p.m. This landmark is marked prominently on the trail. Further up the trail we arrived at Big Savage Tunnel. at the trail and then your ride down hill into Meyersdale. We stayed in an old inn with one of the bedrooms up the longest flight of stairs I believe I have ever seen. 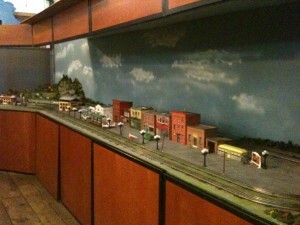 July23, 2012: One of the best things to visit in Meyersdale is the G.I. Dayroom. 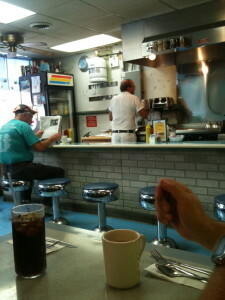 This is a 1950’s style diner with the cook in white uniform cooking right behind the counter. The food was Wonderful the Prices were great!! I have absolutely no doubt we would all go out of our way to eat here again. 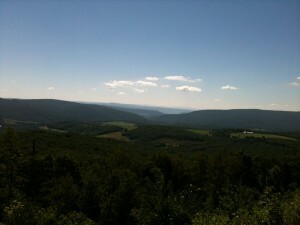 Be sure to eat a good breakfast because to get back t the trail you have to climb the hill back out of town. 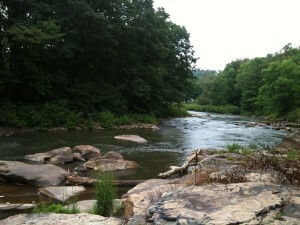 Once you get back to the trail though it’s down hill to Confluence, your next stop. 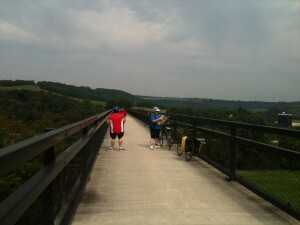 That morning after leaving Meyersdale we crossed another beautiful viaduct. W then pedaled our way thought the deep mountain woods of Pennsylvania. 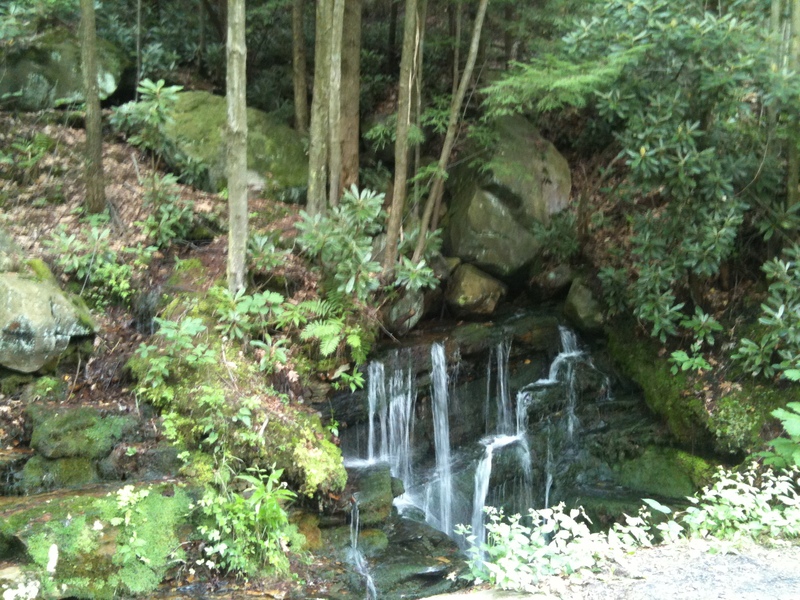 There were water falls coming right out of the side of the mountain and rivers with rocks you could climb out on. It was very beautiful and tranquil. 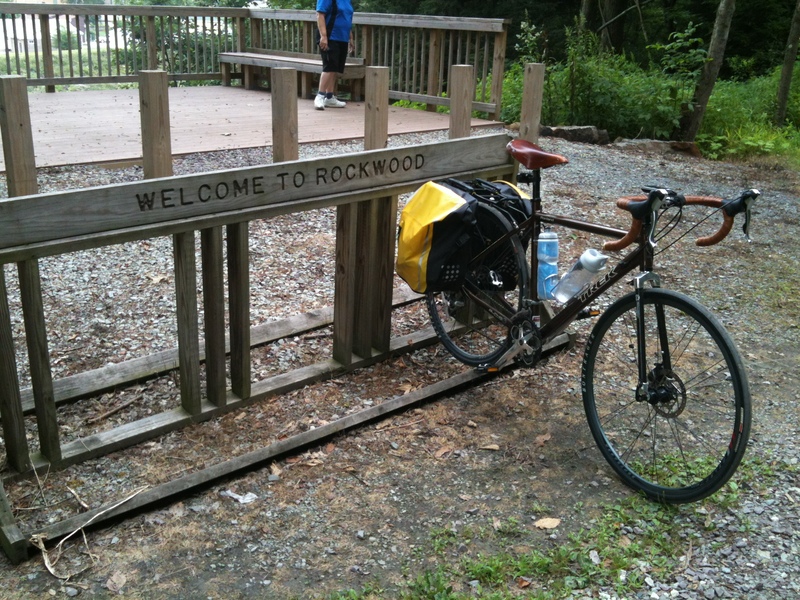 At 12:30 we arrived at Rockwood where we ate lunch and visited a small bike shop which aided us in some drailure and brake adjustments we needed. This was our longest day of pedaling and being in rural mountains where there was no cell service we hardly knew we were on the same planet with the rest of the hustle and bustle of humanity. We arrived in Confluence around 5:30. Locked our bikes at the house of Confluence were we would stay the night and journeyed over to the local restaurant for a well deserved meal. 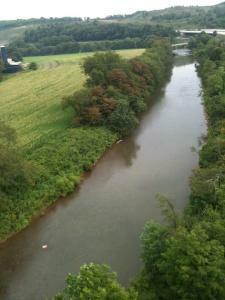 July 24, 2012: A rainy Day. Due to the weather we decided that it was time to alter our trip. 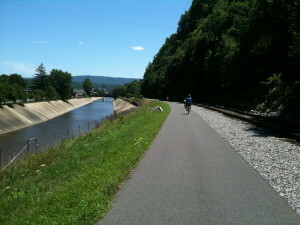 Instead of continuing to cycle north we would turn south by car and head back to Frostburg. 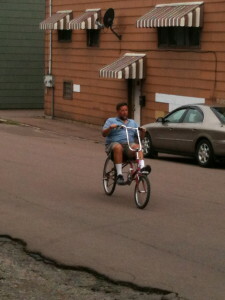 Before leaving confluence we stopped at a local bike shop and got our first chance ever to ride a recumbent bike. It seemed so foreign to us as none of us had ever ridden anything but traditional upgright bikes. When we left Confluence we made the drive to visit the Flight 93 memorial. That is a very nice memorial center and if you are in the area it is worth a visit. 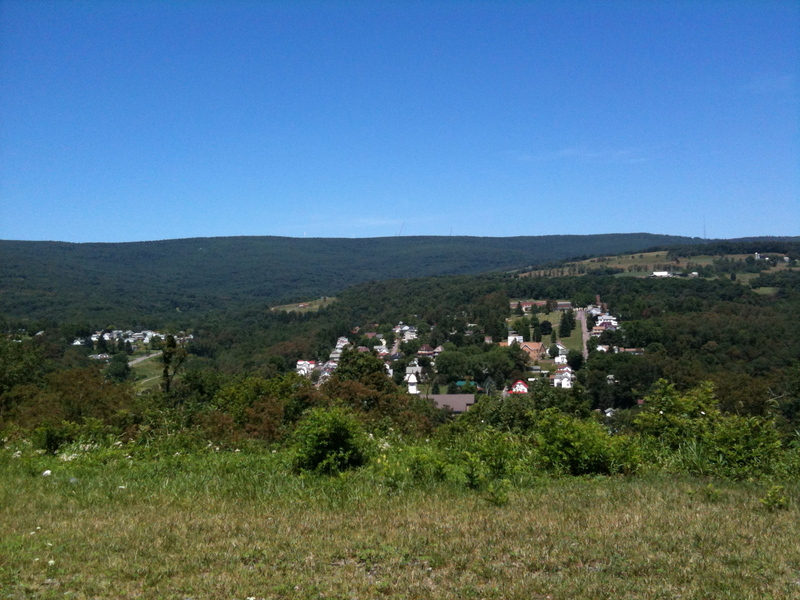 We then went back and stayed at Frostburg and formulated our grand plan for the next day. 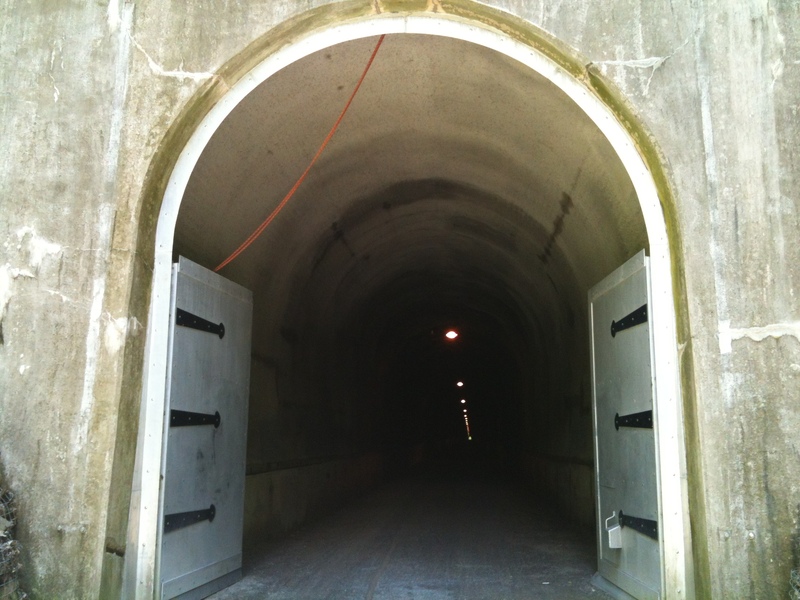 July 25, 2012: We got up that morning and gathered our gear. We had decided to head back to the continental divide by car where we would be dropped off and ride downhill from there to Cumberland. The trail that took us a day and a half to ride uphill took only a few hours to ride downhill. It was a beautiful sunny day. July 26, 2012: This was the day we all dreaded. The day we needed to leave and head home. 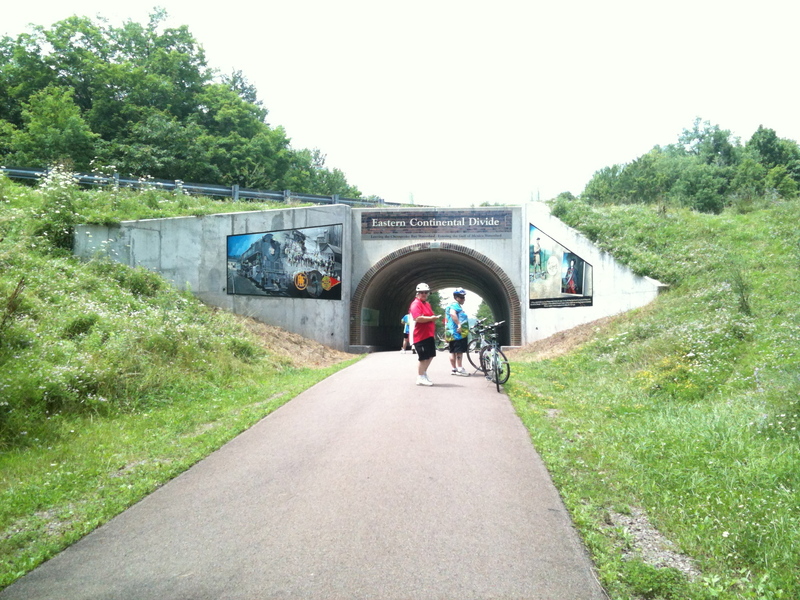 Before leaving Cumberland a couple of us decided to check out the C & O Canal Towpath trail. 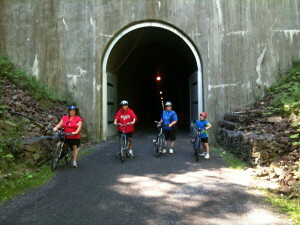 We rode just a mile or two down it to check it out and then loaded our bikes and gear for the ride home. This was the first big bike tour any of us had been on, a whole week of beautiful cycling and I am certain we will all look back on this trip with may fond memories. 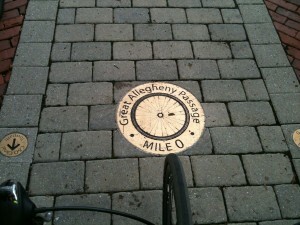 We plan to go back some day and finish the remaining miles of the GAP from Confluence to Pittsburgh.